"The seller of lightning rods arrived just ahead of the storm. He came along the street of Green Town, Illinois, in the late cloudy October day, sneaking glances over his shoulder,..."
"...Somewhere not so far back, vast lightnings stomped the earth..."
...Somewhere, a storm like a great beast with terrible teeth could not be denied." - all quotes from Ray Bradbury's "Something Wicked This Way Comes"
It wasn't Illinois and it wasn't October. 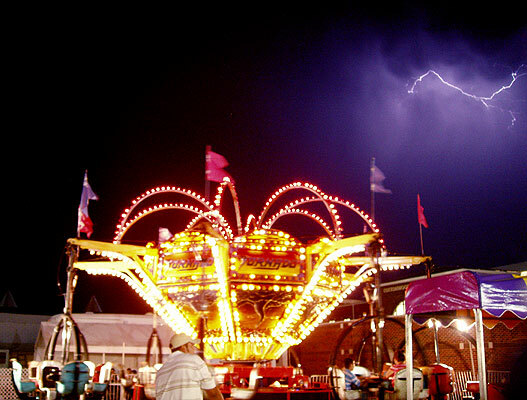 Last night (September 16) at the 2006 Kansas State Fair in Hutchinson, lightning preceded a rain storm that ended most outdoor revelry at 10:50 PM. 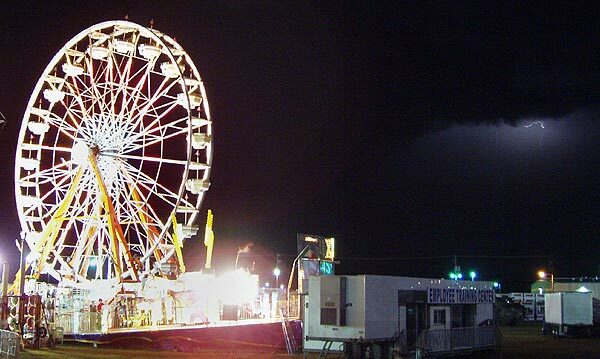 I shot these photos in the carnival area and right across from Ye Old Mill. 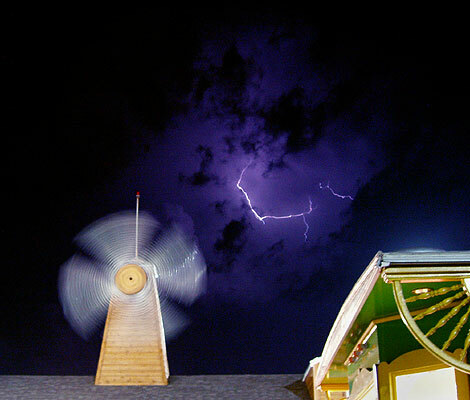 The shots had long enough shutter speeds that the windmill looks like a fan. One thing I like about the inexpensive Olympus C-60 I use for 99% of the shots on this sight is that it's possible to hold it still, with practice, for a second or more. This ride is called the Tornado. Fortunately, a bit of unpleasant irony was avoided and the storm brought only wind, lightning and rain to Hutchinson. 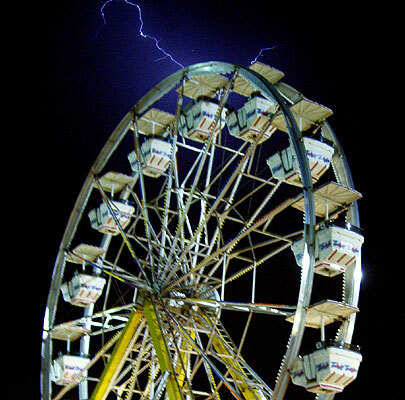 The lightning isn't really anywhere near the Ferris wheel; it just happened to line up that way. "Lightning needs channels, like rivers, to run in." said the lightning rod salesman in the afore-mentioned Bradbury classic that is much on my mind with Autumn approaching. The salesman's statement was more art than science, but he was essentially correct. 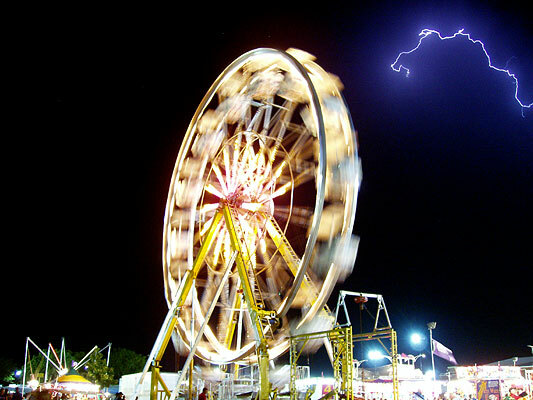 It is a misconception to think that one has to be really fast to shoot pictures of lightning. One way to do it is with a time exposure, preferably on a tripod. Another method - and that's what I did last night - is to utilize the fact that lightning travels repeatedly down ionized pathways in the air. I like to think of them as the channels Bradbury's lightning rod salesman mentions. Realizing this, you only have to be humanly fast, not lightning fast. Just frame your shot within the general area of the lightning you've already seen, wait for lightning to occur and release the shutter as fast as you can, without shaking the camera, and try to hold it absolutely still until the exposure finishes. If you're quick enough, you'll get one of the repeat streaks that follow the path of the lightning bolt you saw right before you took the picture. Of course, the delay in many digital cameras makes this problematic so there is another strategy to use when using such a tool: just shoot, repeatedly, as many pictures as your card can hold. Then, weed through them, deleting everything that didn't catch lightning, and do it again. I did a lot of that, too. Consider carefully your choice of foregrounds and try to visualize what everything will look like in a time exposure. 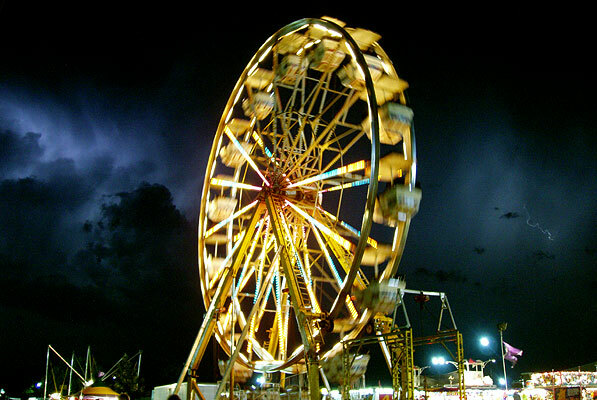 I started out in the carnival and, though some shots worked, the lightning was dim, relative to the neon and fluorescent tubes of the Ferris wheel. So, I moved on to Ye Old Mill because it had a distinct and appropriate silhouette. Bright man-made lights can be a problem and there was one in this shot until I eclipsed it with the vendor's wagon in the lower right corner. 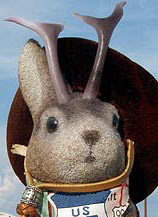 I only wish Ace Jackalope would have been nearby in a Colin Clive (Frankenstein) lab coat. 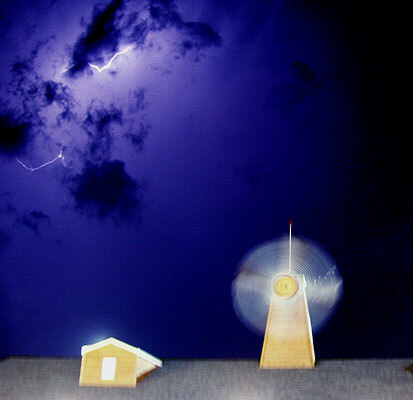 Hi - Some pretty cool lightning pictures. A bit confused with the first picture though - was that taken from a roof of a house? Thanks for the complement, especially from someone who specializes in lightning. The pic was shot from ground level, across a walking lane from Ye Old Mill; you can see a different perspective of the building in this post: http://thelope.blogspot.com/2006/09/bride-of-ye-old-mill.html, which should give you some idea of the angle. The small structure with the Victorian-style gingerbread in the right foreground is a vendor's cart, which I stepped behind so as to eclipse a flood light above and behind the mill. Otherwise the artificual light would have been a competing element in the composition.